Cambridge Audio Sonata DV30 review | What Hi-Fi? Blu-ray may not have taken the world by storm, but now there's a plethora of top-notch products at this price. So where does a £200 DVD player fit in? Cambridge Audio's Sonata DV30 needs to deliver something different. Unsurprisingly, for a company steeped in two-channel history, the DV30 looks to major on sound. Listening to Simian Mobile Disco's Cruel Intentions via the two-channel output, there's impressive weight, punch and power. The drums sound chunky but crisp, while the vocals are airy and detailed. Switch to movies and the Sonata still sounds good. Star Trek is upscaled to 1080p and the DV30 again delivers a full-bodied 5.1 sound over HDMI, while the picture is clean and colourful. But the best Blu-ray players at this money can do all this, too. And more. The Award-winning Sony BDP-S360 delivers a sharper, more detailed image – it's not night and day, but it's there – and it can top it all with superior looking and sounding Blu-ray discs – and a small saving. If you're determined to ignore Blu-ray for a few more years, then this is a fine DVD player, musically one of the best we've heard in a while. 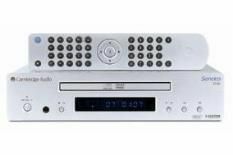 But for any kind of movie buff, we'd be embracing the future – and getting just as much from DVDs – with the aforementioned Sony Blu-ray player.